Three New Innovations From SSK And Available From Baseball Express To Improve Your Game. SSK, a force for innovation in the baseball glove market introduced the new �gDimple Series�h glove to bring your game to the next level. Three new features make this the cutting edge of baseball. First is the patented dimple pattern palm designed to help every player not only catch better, but it improves transitions to your throwing hand as well. The unique leather dimples help grab the ball and stop it in it�fs tracks. Spin comes to a stop, and the ball is securely held in the glove. But that�fs just the beginning, a ball that has stopped spinning is ready to move to your throwing hand and head for a double play. 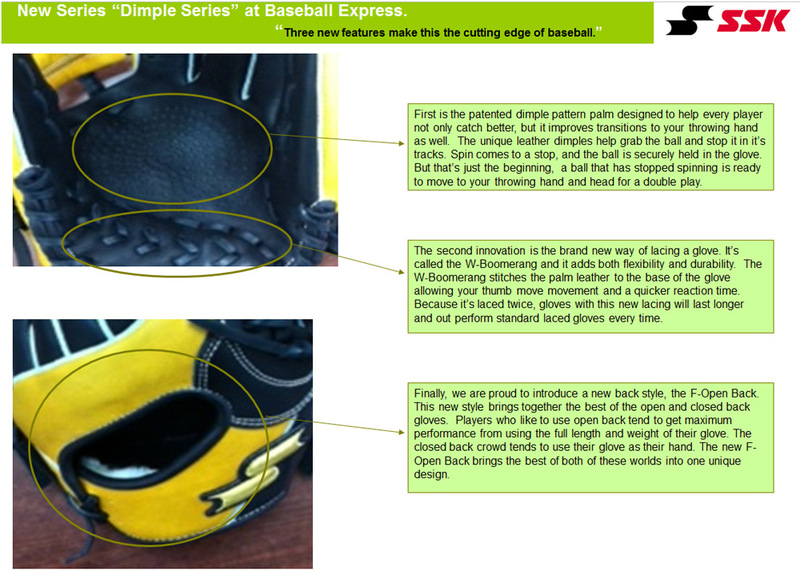 The second innovation is the brand new way of lacing a glove. It�fs called the W-Boomerang and it adds both flexibility and durability. The W-Boomerang stitches the palm leather to the base of the glove allowing your thumb move movement and a quicker reaction time. Because it�fs laced twice, gloves with this new lacing will last longer and out perform standard laced gloves every time. Finally, we are proud to introduce a new back style, the F-Open Back. This new style brings together the best of the open and closed back gloves. Players who like to use open back tend to get maximum performance from using the full length and weight of their glove. The closed back crowd tends to use their glove as their hand. The new F-Open Back brings the best of both of these worlds into one unique design. That�fs the new triple play! The Dimple Series glove from SSK. Available through Baseball Express.